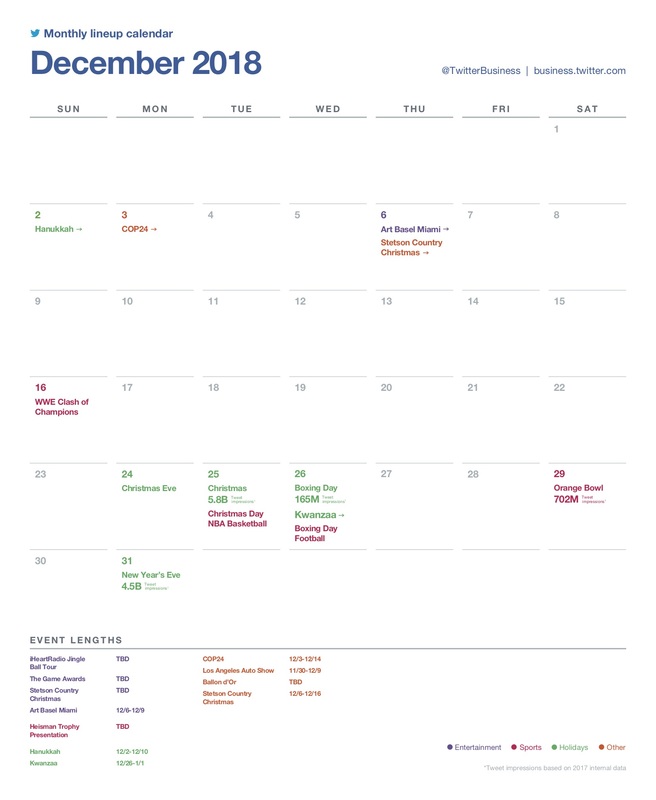 As we head into the closing month of 2018, Twitter has released its latest monthly major events calendar, which highlights all the key dates for social media marketers to keep in mind for their seasonal and thematic content in December. Twitter's event calendars list both the events to be aware of, along with (for selected events) tweet volume stats, based on the previous year, which helps to provide more specific insight into exactly what levels of discussion around each you can expect, further refining your strategic approach. So what are the key dates - apart from the obvious - to be aware of this month? Yes, Christmas and New Year will likely be the key focal points, but there are other events to be aware of which you can tap into along the way, with some more niche, relevant dates of notes in each segment. As noted, Twitter's monthly calendars can be a great resource, and it's worth checking out the listings as you go about planning your tweet approach.